Montreal’s 18th annual march against police brutality was declared illegal a matter of minutes after its scheduled start time of 3 p.m. at the intersection of Jean-Talon and Châteaubriand streets. Montreal police officers dressed in riot gear, including horse-mounted officers, mobilized soon after the announcement to move protesters away from the intersection. 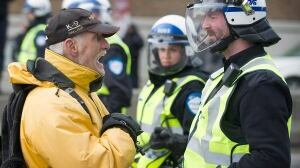 An estimated 150 protesters were soon caught in a kettling manoeuvre south of the protest zone on Châteaubriand Street. A Sûreté du Québec riot squad dressed in green fatigues moved in a short time later to replace Montreal police officers and take over the kettle. The Jean-Talon Metro station, which is located in the protest zone, was closed around 3 p.m but reopened around 4 p.m. The Collective Opposed to Police Brutality, which organizes the march to mark the International Day Against Police Brutality, said this year’s march was organized to highlight what it calls “social profiling” by Montreal police officers, or the targeting of those believed to be homeless and therefore "unwanted." The location for this year’s march is where a police officer was captured on video in early January threatening to tie a homeless man to a pole. The man was wearing only a T-shirt and shorts in below –30 C weather and had been acting aggressively toward passersby. The officer was disciplined after the incident. Organizers also pointed to two other separate incidents that saw police shoot and kill Mario Hamel and Alain Magloire after confronting them on the streets for aggressive behaviour. Both men had experienced homeless spells and suffered from mental health problems. The early morning shooting of Hamel in June 2011 also resulted in the death of Patrick Limoges, a hospital worker who was walking home after his shift and was struck by a stray bullet. Last year’s march ended with more than 250 arrests and more than 150 were fined $637 for participating in an illegal event. Organizers have once again refused to provide police with an itinerary and route for today’s protest, saying it allows police to take preemptive measures to restrict and disrupt the protest. "It is not to the police to decide if we have the right to protest or not," the COPB says in a press release. Refusing to provide an itinerary makes the march technically illegal and sets the stage for more arrests this year. Past marches, however, have been marred by acts of vandalism and even violence and seen riot police respond with stun grenades and mass arrests.